The S-400 missiles, which were introduced in 2007, are the new generation of Russian missile systems, and so far Russia has only sold them to China and India. The S-400 missile system negotiations between Ankara and Moscow are a done deal, President Recep Tayyip Erdoğan said Tuesday amid comments from U.S. officials that it was a "worrying move." Turkey had sought a deal with the U.S., but their failure made the country look for alternatives. "Yesterday, a reporter asked me in the airport that since the U.S. said if we make a deal with the Russia regarding the S-400s, there would be tension. Why would there be a tension? If we can't do what we have wanted to do with the U.S. for years now, we have to be in search of alternative options," Erdoğan said in an address to the Justice and Development Party (AK Party) group meeting at Parliament, adding that the deal was signed. Ankara's close contact with Moscow has been closely watched by Turkey's NATO allies. Chairman of the U.S. Joint Chiefs of Staff Gen. Joseph Dunford said at the annual Aspen Security Forum in Colorado that Turkey's possible purchase of Russian S-400 missile defense systems is "worrying." "Turkey has not completed a deal with Russia yet. If they would, it would be concerning," Dunford said in an interview with the NBC television station at the forum. Responding to Dunford's remarks, Erdoğan said: "Greece, which is also a NATO member, has been using S-300 for years, no one says anything. We have taken some steps with the Russia now, there has been signatures. I hope that we will see the S-400s in our country. We will also continue the process for their joint production as well." Mustafa Kibaroğlu, chairman of the Political Science and International Relations Department at MEF University, said that Greece had also purchased defense systems from Russia previously. "In 1998, [Greek] Cyprus bought S-300 missiles from Russia and the U.S. did nothing to prevent it," he said. "With the Turkey's determined stance on the issue, the missiles were sent to the Crete Island rather than the Greek Cyprus. Although did not touch on the missiles for years, eventually, Greece integrated them into its national defense system," he added. Turkey will be the first NATO member country to purchase the S-400 defense system if the deal is finalized. 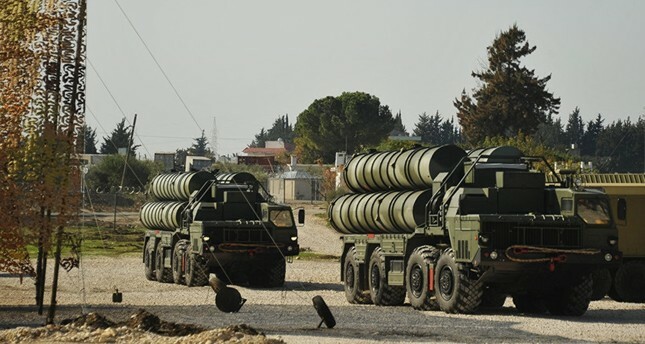 With the purchase of the S-400's, Ankara aims to build Turkey's first long-range air and anti-missile defense system to guard against threats in the region. "When Turkey wanted to buy air defense systems from China, many opposed to it. We asked why they are against it since they did not oppose when Greece bought S-300s from Russia. They said that Greece will use those missiles in its national defense system separately from NATO. When we decide to do the same thing, however, it becomes concerning," Kibaroğlu said. "Another reason why the U.S. did not oppose Greece buying missiles from Russia was to have the chance to examine Russian missile systems." The S-400 missiles, which were introduced in 2007, are the new generation of Russian missile systems, and so far Russia has only sold them to China and India. Last year, both China and India signed an intergovernmental agreement for the procurement of four regiments of Russian-made S-400s, and delivery of the new air defense systems is expected to begin in 2020. The defense system is able to carry missiles, which has the capability to destroy ground and air targets, including ballistic and cruise missiles. Turkey has agreed to pay Russia $2.5 billion for the S-400 systems, a Turkish official said on July 13. The official, speaking to Bloomberg on condition of anonymity, said that Turkey wants to build its own missile defense systems. "For Turkey, the key aspect of any deal is transfer of technology or know how. The Russian agreement to allow two of the S-400 batteries to be produced in Turkey will serve that aim," the official had added. Commenting on the S-400 deal with Russia, Nurşin Güney, an international relations professor at Yıldız Technical University, said that the purchase will help eliminate Turkey's dependency on others for its defense. "Turkey has two aims in this deal. The first is to fulfill its need to have an air defense system and, second, to get rid of any dependency and be able to produce missiles itself, which takes higher priority." Güney added: "When others do similar things, there is no problem but when Turkey does it, there is always a crisis. There is also another mutual missile defense system agreement with the Italians and French that is conducted parallel to the one with Russia. Yet, no one makes statements against it." Defense Minister Fikri Işık announced in early July that Turkey had signed an agreement with Italian-French consortium Eurosam to develop its national missile defense system. "I am happy to announce that this afternoon Turkey has signed a cooperation agreement with Italian-French consortium Eurosam to produce missile defense systems," he said at a reception for Bastille Day at the French Embassy in Ankara. According to the deal, Turkish companies and Eurosam will work together to produce SAMP/T Aster 30 long-range surface-to-air missile (SAM) systems, which are already in use in several NATO member countries. The SAMP/T Aster 30 system uses a network of sophisticated radars and sensors, including 3-D phased array radar - enabling it to be highly effective against all types of air threats. The system can intercept missiles with a 600-kilometer range and it can operate in standalone mode or can be integrated in a coordinated network such as NATO missiles defense system.